3 Hatchbacks van verschillende komaf, welke gaat er met de eretitel vandoor? Carmagazine nam ze mee voor een uitgebreide trip om daar achter te komen en zocht de verschillen, in zowel de voor als tegen punten om ze vervolgens een plekje te geven in de top 3 hatchbacks, wie wint het in deze ronde en waarom? Each of these three travellers has taken a different route to get here, and has a different tale to tell. 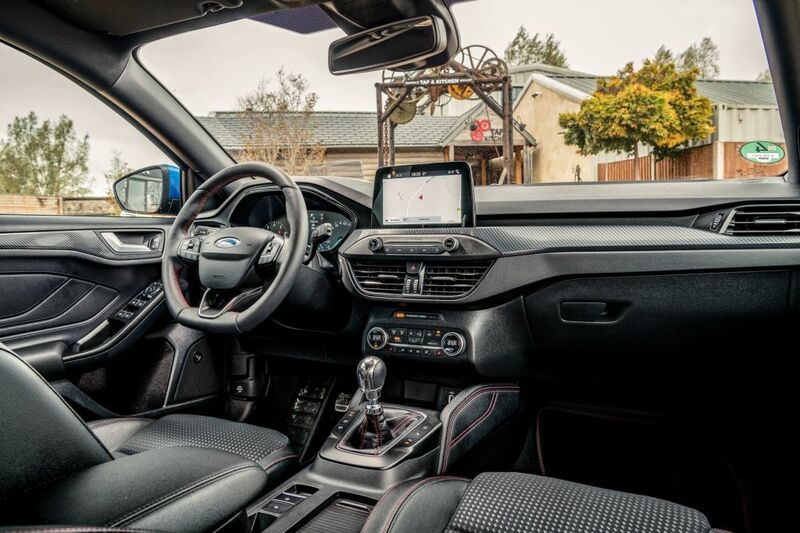 Ford’s Focus was once the talk of the town; wind back to the late ’90s and its winklepicker New Edge styling and even sharper handling were nothing short of a revolution for family car-kind. It looked like no other hatch and handled like a hot one, but over the years it homogenised into an okay also-ran, its edge seemingly lost with its panel creases. Now, in new-from-the-ground-up Mk4 form, it’s back for another shot at the title. The Kia Ceed has taken the opposite path, from workaday journeyman to genuine contender. The Korean company’s days as a purveyor of cheap, cheerful white goods long of warranty but short of character are gone. The Ceed, and Kia as a brand, can now be considered on an entirely even footing. It’s also no longer that cheap – prices kick off from low 18s for the base 1.0-litre version, and this fully flush First Edition passes the £26k mark, broadly comparable with the well-specced Focus ST-Line X squaring up to it here. And the Ceed is newly de-punctuated – the artist formerly known as Cee’d has lost its nonsensical apostrophe for its third generation. And the A-Class? When the original launched, almost a school year ahead of the Focus, it was a bit of a weirdo: a high-rise mono-volume iconoclast with fascinating packaging but teetery handling. Mercedes had another, slightly more bloated stab at the formula with the second generation before a sudden career change to become a much more conventional – and largely undistinguished – C-segment hatch in 2012. Now in Mk4 guise it’s matured into our reigning premio-hatch champ, having seen off the VW Golf in CAR’s August 2018 Giant Test. It’s markedly pricier than the other two; can it justify the extra expense? So, three very different paths now converging onto the same road for one test. 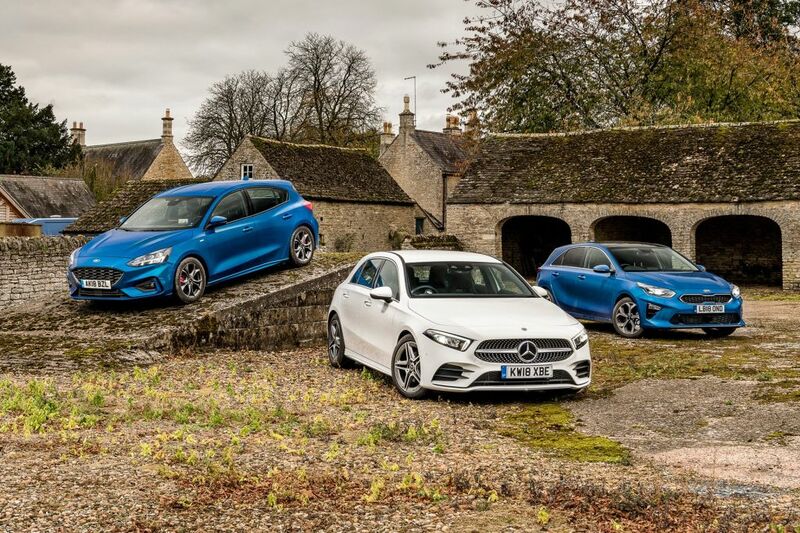 Each has a turbocharged petrol engine around a litre and a half in size, newly independent rear suspension (standard on the Ceed, fitted to certain variants of the Focus and A-Class), and a point to prove. Looking at them side by side, they’re also virtually the same shape if you squint, but the three-pronged badge on one of them says things the others don’t. There is an undeniable sense of cachet about the Mercedes; during the test I did that thing where you stop slightly early for a pedestrian approaching a crossing and they feel compelled to hurry across while mouthing ‘Thank you’. But this time the gent also motioned at the Mercedes badge and mouthed ‘Nice car’. It certainly feels a cut above inside. This is a real event interior, with clever use of surfaces and materials to create something genuinely different. Even if some of the materials feel cheaper than they look up-close, and the plastic moulding around those delicious illuminated turbine vents flexes a worrying degree if you give it a nudge, the overall impression of the various aluminium, suede, pleather and piano-black plastic elements is one of cool modernity. You get the impression Mercedes’ designers had a lot of fun in here, and that it’s angling for a younger audience than the norm. So millennial is the new A-Class cabin that the first thing it does on start-up is ask you to sign into your own profile so it can recall your preferences for seat position, radio stations, display layout and the like. It also opts for digital screens in place of analogue dials and touch-sensitive pads in place of physical switches wherever possible. Or, indeed, voice recognition in place of touching anything at all. 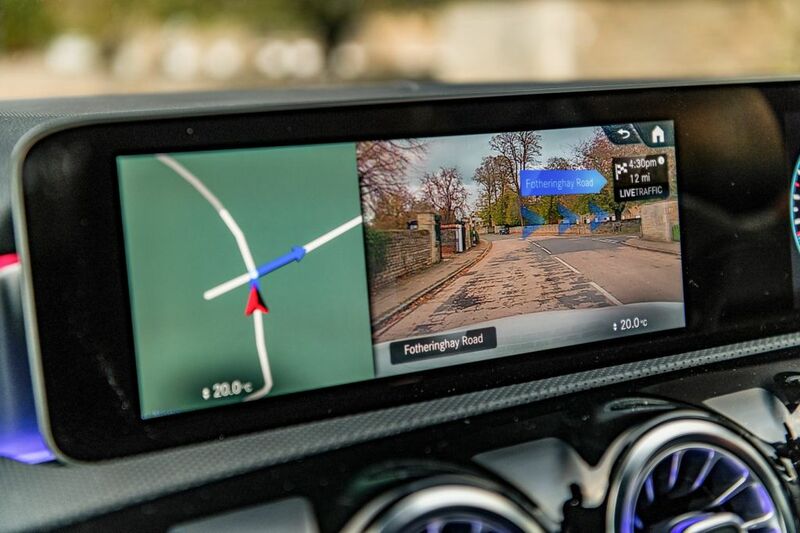 Say ‘Hey Mercedes’ to wake up the Linguatronic system and follow it up with ‘Take me to work’, ‘Warm me up’ or ‘I’m hungry’ and it’ll set the nav, heat the seats or search the map accordingly. Ask it to tell you a joke and it replies from a comedy repertoire – ‘Sorry, my engineers were Germans’, that sort of thing. Less endearingly, almost every time you or a passenger says the word ‘Mercedes’ in passing, the system is immediately activated. We soon turned it off, using the voice control switch on the steering wheel instead. The Ceed, by contrast, couldn’t be more traditional if Fred Dibnah had been chief designer: chunky plastic switches with uniform red backlighting, a decent touchscreen with simple graphics and twist dials to zoom the map, and two big analogue gauges behind the wheel. Dull, but distraction-free, it’s the most intuitive and user-friendly interior here. It saves the surprises for the way it drives. Okay, it doesn’t steer like a Lotus, but the first few degrees of lock off-centre get an immediate and accurate response, and the chassis likewise. Kia’s put some real effort into making the Ceed handle this time, with stiffer front springs, new mounting points and that redesigned rear suspension, and it’s paid off. On a favourite road, trailing the brakes into a medium-speed corner and feeling the car tighten its line while maintaining flat yet supple body control, I have a sudden realisation – I’m actually quite enjoying this. I’m having fun in a Kia Ceed! This Ceed’s cause isn’t helped by its dozily calibrated DCT auto gearbox – choose the entirely decent standard six-speed manual ‘box instead. The pay-off for the better body control is that minor surface tremors are more readily felt through the stiffer suspension, especially by rear passengers. But large bumps are damped superbly, and ride quality is no worse than the larger-wheeled A-Class. The Merc is markedly quicker than the Kia, but the A200’s 1.4-litre turbo engine is coarser and its dual-clutch transmission is even worse for choosing the wrong gear at the wrong time (although it at least gets manual override paddles behind the wheel, unlike the Kia). It can be tremendously abrupt on initial pull-away, even to the point of occasional, and embarrassing, accidental wheelspin at junctions. This A200 (our long-term test car) is in semi-sporty AMG Line trim, which includes the independent rear suspension upgrade over base models’ torsion beam, and it’s fun to drive in its own way. The power steering’s speedy initial response and meaty weightiness off-centre makes it feel peppy on turn-in, and it’s a relatively grippy, flat, stable platform to drive quickly. But for a favourite road, I’d take the Ceed over the A-Class. Unless the Ford was about. The previous-generation Focus was decent to drive, especially post-facelift, but the new car is very good indeed. 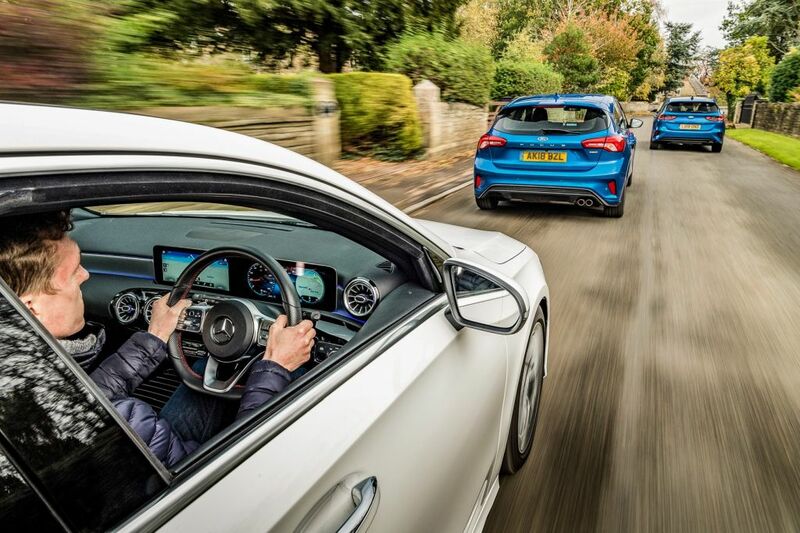 Steering is fast yet accurate, requiring very little lock to twirl the car into an apex, and traction on corner exit is leagues ahead of the other two. Like them, the Focus is on passive dampers (adaptives are a £650 option) but its ride quality and body control are leagues ahead, somehow managing to feel both firmly damped yet comfortable. 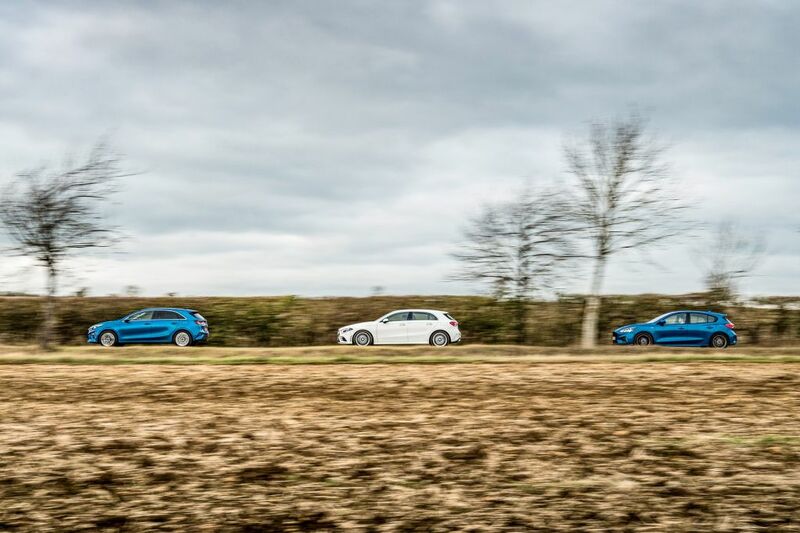 On a particularly bumpy section of road where the Merc skims its nose and the Kia pogos like Tigger, the Ford takes it all in its stride and then dances through every corner that follows. Its pointy-nosed handling balance has a little of the character of its fun-sized Fiesta sibling, in a calmer, bigger form. This Focus also shares quite a bit of its engine with the Fiesta ST hot hatch. 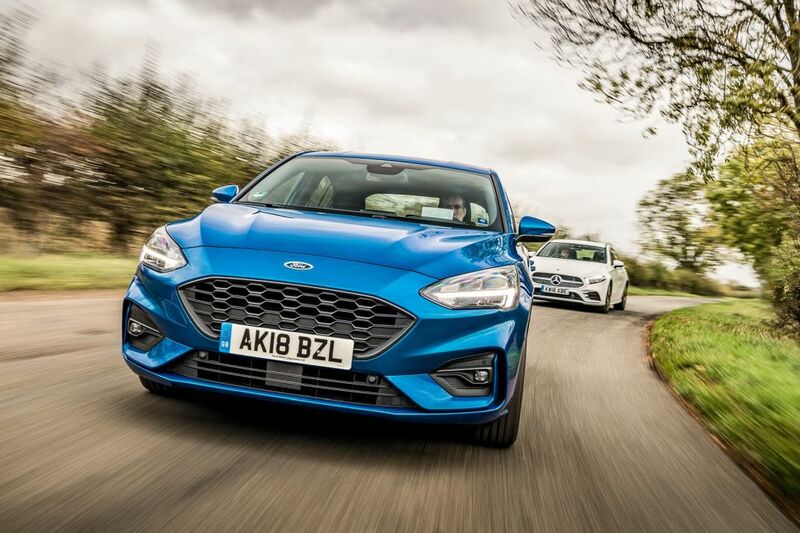 Unlike the other two, the Ford employs a three-cylinder 1.5 rather than a 1.4-litre four-pot, and despite the piston shortfall, a touch of turbo lag and long gearing, it still feels the fastest, punchiest and most characterful on the road. It’s got more go than the Ceed, and it’s less harsh than the A-Class. The Focus is also the most refined car overall. 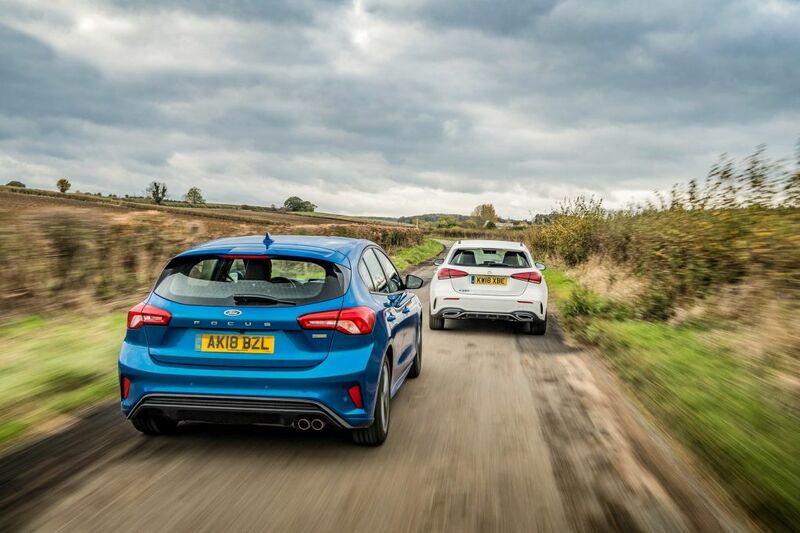 The Mercedes and Kia transmit a fair bit of tyre noise to the cabin, but the Ford is unruffled at a cruise. That’s partly down to having stiffer body and suspension mounting points than its predecessor, as useful for noise suppression and feedback as for handling. It’s not perfect, of course. Its turning circle is surprisingly unwieldy (a regrettable hallmark of modern Fords) and if the A-Class interior is an adventure in forward-thinking design, the Focus’s looks more like that of a five-year-old run-out model: safe, sober and more humdrum even than the Ceed. Matters are made worse by the sub-lunchbox interior plastics, which in this car were greasily shiny, perhaps as a result of a misguided attack of cleaning spray before the car reached us, which only served to highlight their scratchily cheap feel. Basic, hard-wearing plastics are fine in a family car, but by the standards of today’s market the Focus feels lower-rent than it should. The dash is well laid-out, though. 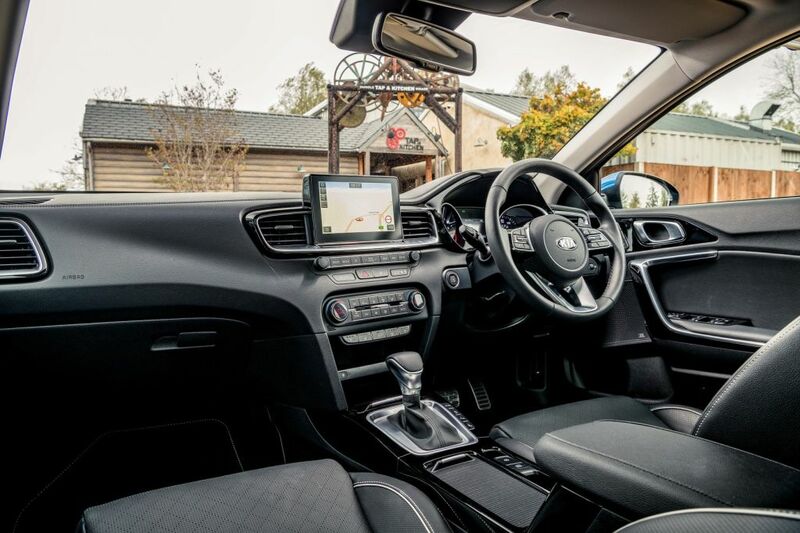 In the old Focus the centre console jutted into the cabin like the lumpy sole of a giant trainer, but the flat new design is far tidier and more intuitive. Full of places to put things, too. Like the other two, Ford has ditched the manual handbrake to free extra cubby space in the centre transmission tunnel and scooped out a big hollow under the dash ahead of the gearlever for more stash space, including a wireless phone charging pad as a £100 option, standard on the top-spec Ceed. The Kia too squeezes in plenty of storage throughout, and feels the roomiest for rear passengers. You could easily fit three adults behind two tall front passengers with minimal rubbing of knees and shoulders. By contrast the tall-ish transmission tunnel in the A-Class steals middle-seat legroom and the angle of its side windows pinches a little shoulder space, but it’s still a practical family car. Like most current medium-sized hatches, all three cars suffer from poor over-the-shoulder visibility past their broad C-pillars. All three pack in plenty of cameras, too, and are capable of taking care of their own braking, accelerating and steering in traffic, to a point. The Kia feels like it would be happier for you to do it for yourself: its lane-keeping assistance system is trigger-happy, and, if you’ve deactivated it, has the annoying habit of turning itself back on when you restart the car; and a dashboard warning occasionally scolds smooth drivers for not keeping both hands on the wheel, when in fact they’re firmly grasping it. The Ford is more nervous still, flashing an imminent-collision warning light and beeping at us more than once during the test when there was nothing in the car’s path. The perfect compact family hatchback probably lies somewhere in a Venn diagram of these three: we’d love a car that combined the Kia’s sheer ease of use and roominess, the Ford’s drivetrain, dynamics and driving position, and the Mercedes’ interior wow-factor and badge snobbery points. But which can please the most people, most of the time? The new Ceed takes third place, which feels unjust in some ways. It’s better to drive than any of its predecessors (and is dynamically superior to the Mercedes), and is arguably safer too, given the minimal distraction factor of its well-thought-through cabin. While this First Edition model is pricey, it wants for nothing in terms of standard equipment. Pass the sticker price through the prism of monthly lease rates and PCP deals, as the vast majority of buyers do, and it’s good value for money. But while the Ceed has bags more character and desirability than it did before, it’s still the most vanilla of these three, almost too sensible for its own good. 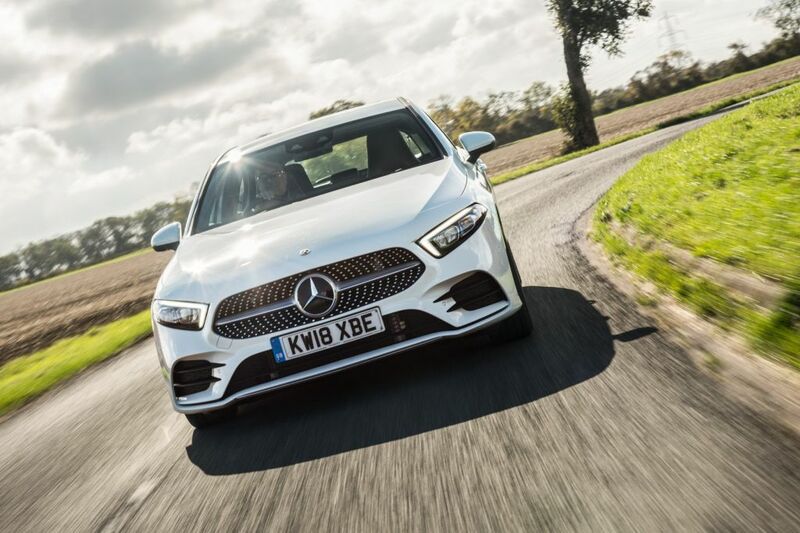 The Mercedes is the opposite: bold, extravagant and hugely expensive from a monthly payments perspective – so much so that many buyers weighing up the pros and cons of the Ceed versus the Focus perhaps wouldn’t consider stretching to the classy German. Where it justifies its extra asking price is in the scope of its design ambition and use of materials inside the cabin, if not outside. 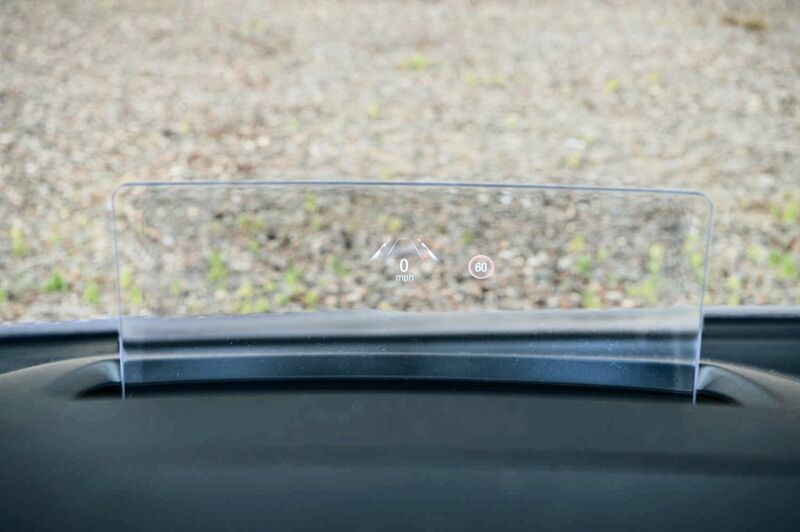 The A-Class’s user interface can infuriate as much as it captivates, but it becomes more intuitive with every use. For creating an interior that looks way ahead of anything else you’ll find in the family hatch market, and more alluring than many in the segment above, Mercedes should be applauded. Even if the Ceed is objectively the better car, the A-Class dreams bigger and has it licked for subjective appeal. Which leaves the Focus. 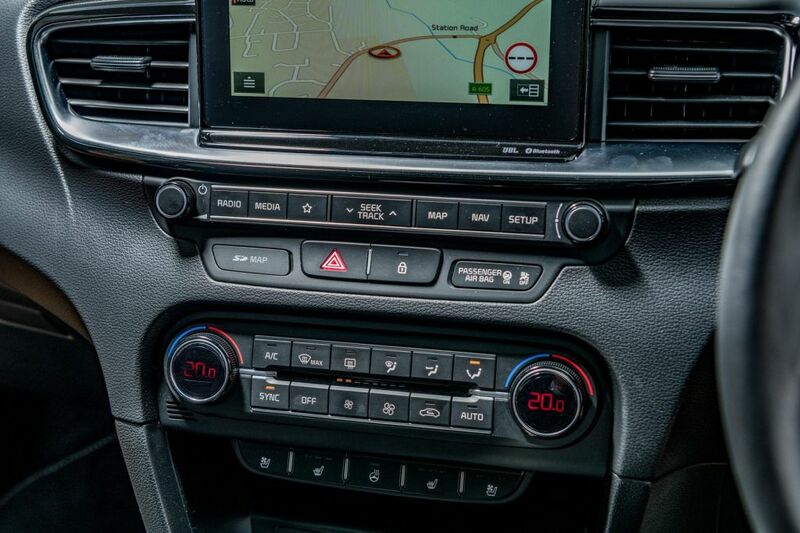 Get over the disappointment of the cheap cabin and you’ll soon be revelling in the perfect control weights, the spot-on driving position and impressive refinement at a cruise. 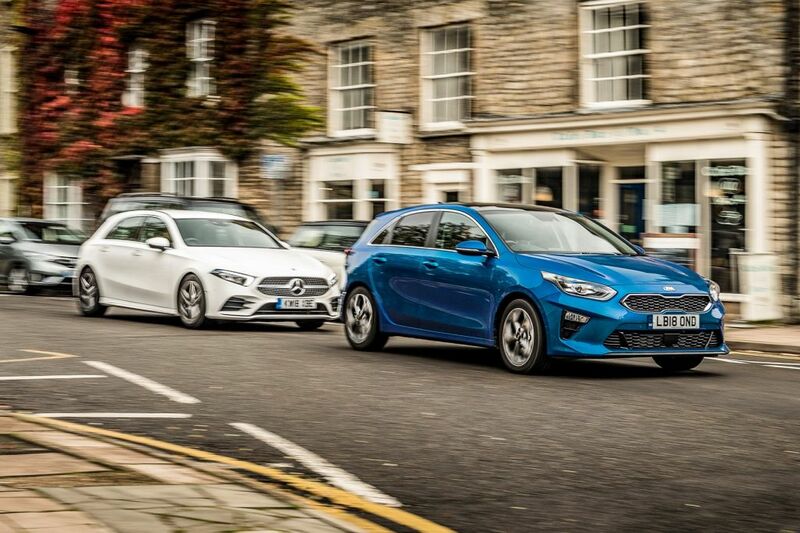 Get to a set of corners and it brightens your day in a way other family hatchbacks can’t, while matching them for engineering nous, practicality and comfort. It’s not perfect, but 20 years after the Focus first sat on the hatchback throne it’s managed to scramble back up there. The best to drive. Practical, comfortable and well-specced, too. Cheap interior, but the Focus is back on top.